MANILA, Philippines – President Rodrigo Duterte reiterated over the weekend that the country’s military should be loyal to the Constitution at all times. 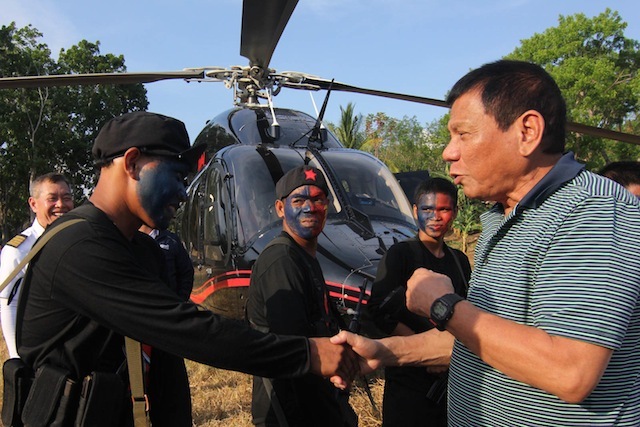 Speaking before soldiers at the Armed Forces’ central command in Cebu, Duterte said he can empathize with the military because his father was also from the ranks of the military. “I feel strongly for the soldiers. I don’t need anything from you. I do not need your personal loyalty for me. Just love your country. Obey the Constitution, period,” said Duterte, also the country’s commander-in-chief. Duterte had early on asked the same to members of the Presidential Security Group. Duterte has been telling troops that he has no intention to strike a coalition partnership with the Reds despite his intent to initiate peace with the Communist Party of the Philippines during his term. According to Duterte, the military and the police are his partners in combatting the apparatus of the illegal drug trade in the country. He admitted that he has given a go signal to kill to the military and the police to neutralize the drug groups which have destroyed many Filipinos families. “And I feel for my soldiers and Davao City really improve to what it is now because of the police and the military. Iyon talaga ang totoo doon. Sino naman pala ang inutusan ko na pumatay niyan? Eh ‘di pulis pati military,” he added. He said he would back all his men against criticisms and legal challenges that may arise from his strong anti-drug campaign. “I mean I had the full cooperation. And in return I was also loyal to my men,” he said. “Human Rights (concern) tayo dito. But you know, talagang inalagaan ko. At wala namang nasabit because I was there to protect them. So ang sundalo pati pulis malakas ang loob,” he said.